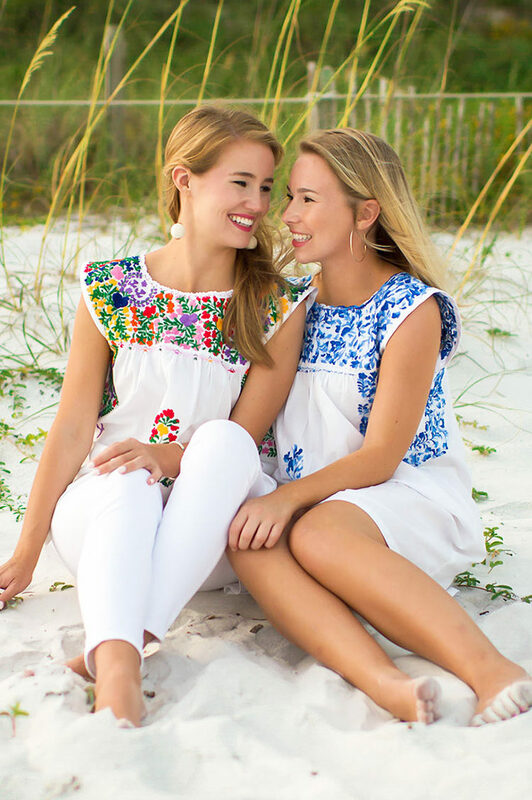 It’s one thing to love the look of a piece of clothing… to love the company behind it is another altogether. And friends, I’m positive that if you haven’t already, you are going to fall in love with a line I am so thrilled to share with you today… Mi Golondrina! 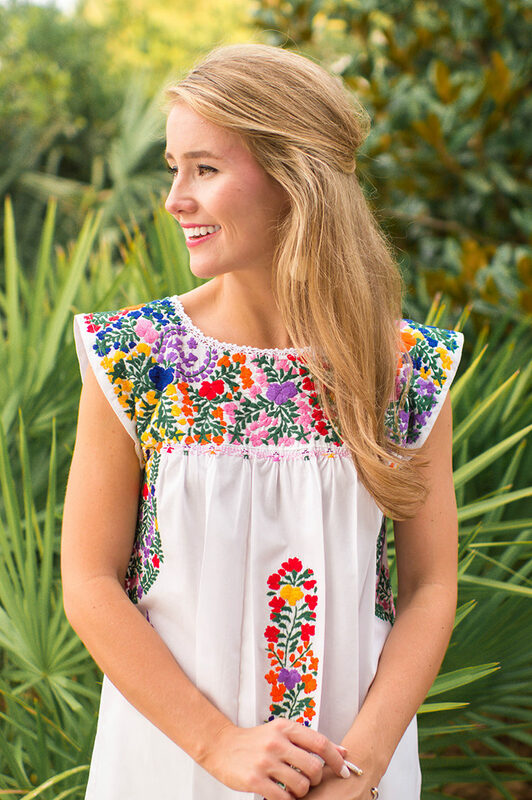 If you’ve visited Dallas, you may have spotted one or two Mi Golondrina pieces around town, as these gorgeously embroidered tops and dresses have become a must-have in well-curated closets across the city. Their vibrant colors and gorgeous quality are so eye-catching, in fact, that I vividly remember the first time I saw one! I was interning the summer before my senior year of college, and Alison, who sat across from me, had on a top that looked just like the one I’m wearing today. I was immediately smitten, and have dreamed of owning one ever since! 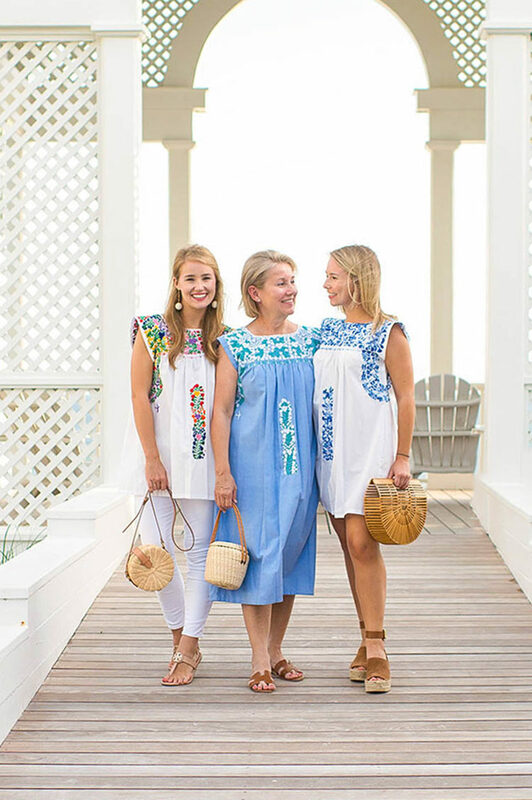 That dream came true not just for me, but for my mom and sister as well when we visited the Mi Golondrina showroom before our family trip to Seaside! 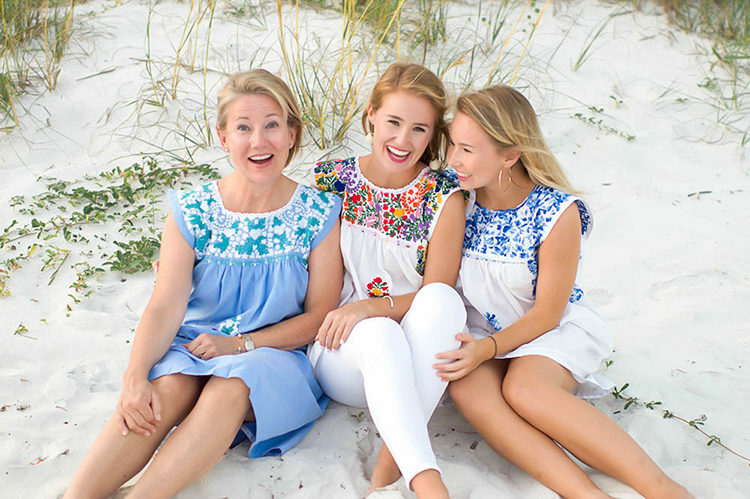 Our hearts were set on bringing these beauties to the beach, and let me tell you… the process of picking out our tops and dresses was just as fun as wearing them! The kaleidoscope of color and fabric combinations was truly jaw-dropping. We were like kids in a candy store! After weaving through gorgeous frock after gorgeous frock, we each finally found one we simply couldn’t leave without. 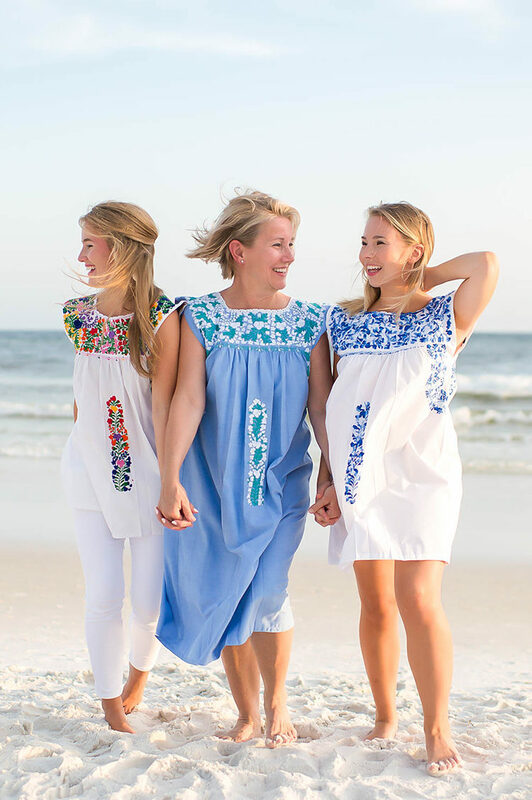 The fun thing about Mi Golondrina is the artisans from Mexico send these dresses full-length, and they are then cut into different lengths and sewn into different sizes. 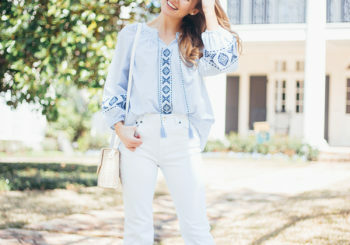 I knew I wanted a top (I’m telling you, I’ve had my eye on one for four years! ), but my mom and sister were undecided. 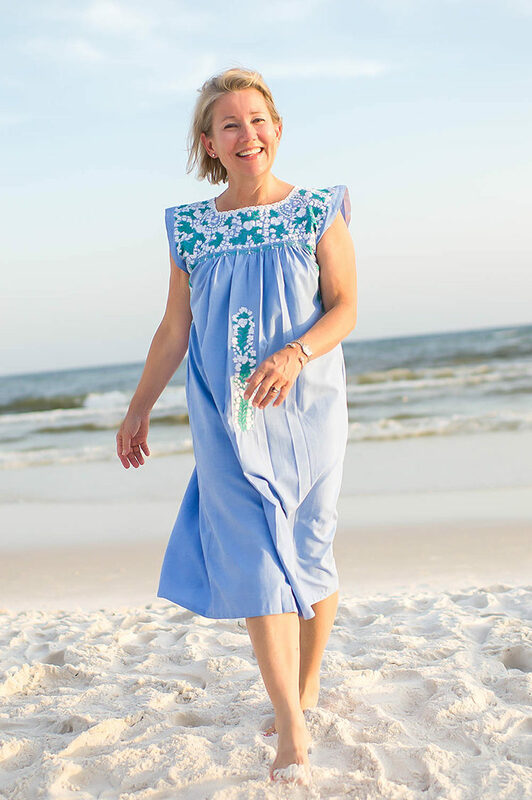 The fabulous Mi Golondrina staff played with different hem lengths until they both found the perfect fit – tea length for my mom, and a mini dress for my sister! Let me just speak to the quality of these garments, friends. 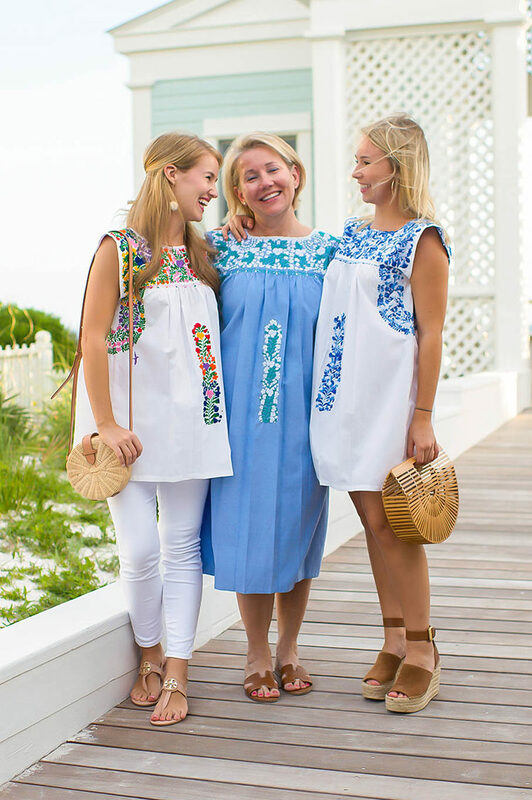 Each dress is hand stitched, and takes at least a month to complete. Doesn’t that blow your mind? 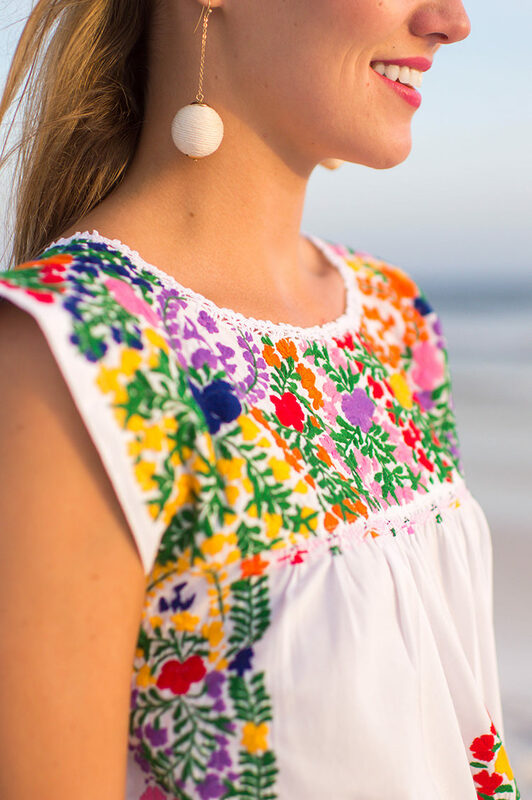 I’m telling you, you can see it the second you lay eyes on a Mi Golondrina top or dress. (They offer beautiful home goods as well!) These are pieces you’ll own for a lifetime. Another thing I love about Mi Golondrina is that the line is truly multi-generational. 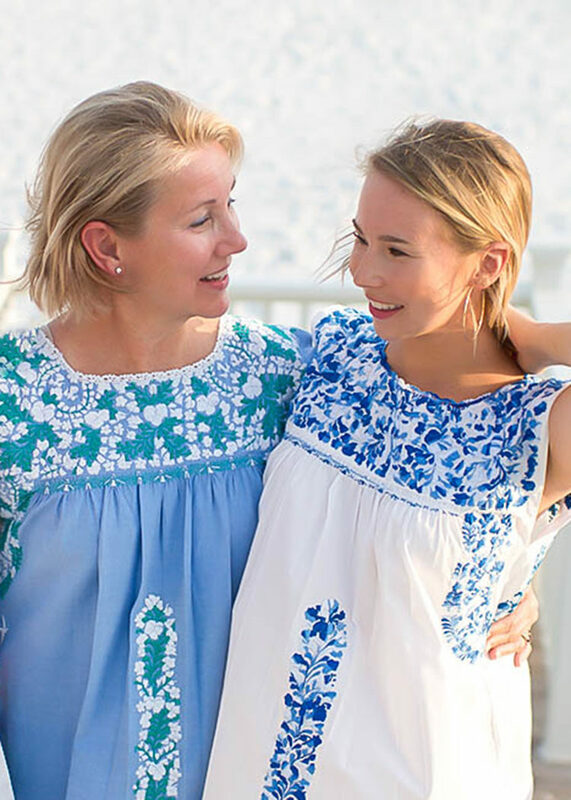 It is so rare to find a line that both mom and daughter love and wear. If you could only see the darling bloomer sets they have for babies! I’ve had this top for all of two weeks now, and can’t even tell you how many times I’ve already worn it. I have a feeling that this is the start of a life-long collection! I wish each of you could visit the showroom to see these beauties up close and in person. The next time you’re on the hunt for a gorgeous gift (for another or yourself!) you know where to go! Thank you for these gorgeous pieces, Mi Golondrina! We will cherish them always! It’s so interesting that the dress is full length and then you pick the length you want. That’s so cool and fun! The three of you look gorgeous in them and now I want one too! So beautiful — all three of you! I love the customizability of Mi Golodrina! These photos are beautiful!! Can you share what camera/lense you use? THANKS! These are absolutely gorgeous! I love the bright colors in yours. These pictures are so pretty too! Reminds me of my Dallas-years! Loved the look then and now! All three of you is really gorgeous! These are absolutely stunning! I knew as soon as I saw them on your insta-story that I was hooked and in love! Hi Kate! How does the top fit? On the site it says to size up for fit, so if I am usually a small would you recommend that I size up to a medium? What did you end up doing? Thanks in advance!